« 2013 Genomics: The Era Beyond the Sequencing of the Human Genome: Francis Collins, Craig Venter, Eric Lander, et al. 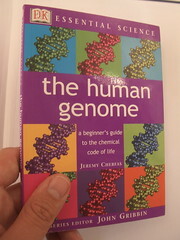 Many thanks for ths comprehensive review of the milestones along the way of Cracking the Human Code of Life. It is very creatively laid out and very thoroughly examined for the significance each milestone has contributed to the discovery process. It reads like fine poetry, one can reread it and each time discover something new hidden in this text. We, the Readers, are impatiently waiting for Part IIB, Part IIC and, yes, Part III. ONLY, then I will go back to reread Part I and look for the American Chemical Heritage documentary on the pre double helix discovery milieu in the UK.